It felt like January, 2015, but who knows? Maybe it was beyond the end of time when DC Comics published the fine work of J.M. DeMatteis, Andres Guinaldo, and Walden Wong. Or maybe it was back when time was young and new and magic was strong beyond comprehension. It's tough to keep track. To QUOTE Groot: “I am Groot”. So there's the World Tree, see? And it's the root of the Green. And so much more. It's alive. It's benevolent. And it's speaking to Swamp Thing. And so, long story short, it is the deus of sorts in our magical, mystical deus ex machina to get our team back together again. Not that it comes easily to them, of course. There is much magical strife involved in getting everyone in the same time and place. But is it the right time and place? None of our team is anywhere that looks like the world where the rest of the New 52 takes place. Nor are they anywhere near the now. Well, some of them were in the The Now, but that's different than the now. Case sensitivity is everything here. But, yeah, they're reunited and it feels so... psychedelic. But they'll be fine now, right? Once you've communed with the World Tree, you don't go back. This is one of those comics where you just need to jump in head first and enjoy the ride. There are no mysteries to figure out. There are no evil plots to foil. There are no surprise twists or cliffhanger endings. We just have a fun ride with our characters, who take turns being on the verge of going mad and talking their teammates back from madness. We get a lot of narrator boxes from different team members, and it's a great ride. There's a lot of great visuals of the assorted and sundry flavors of magic used in this issue. 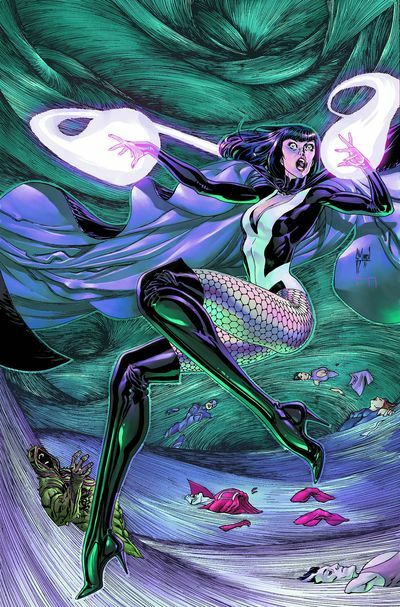 Guinaldo and Wong's art is spectacular, especially when they're illustrating Zatanna's perception of the World Tree floating in the rainbow acid trip inside her head. Note to self; should I ever find myself in the fictional world of the DC Universe, pay a visit to Zatanna's head. I still can't fully endorse Guinaldo and Wong's take on Andrew Bennett, Madame Xanadu, or Zatanna, but they're growing on me. Otherwise, the only bone I've got to pick is a minor one with the crescendo of solving our primary conflict (team scattered across time) and replacing it with a secondary conflict that feels far less dire. “I sat here starin' at the same old wall. Came back to life just when I got your call.” That's right. Zatanna's been spending an awful lot of time hanging out with a tree, hallucinating a family with Constantine, and talking to the dismembered heads in her... errr... head. But now she's back with her friends -- well, most of them, at least, even the non-bipedal one -- and it feels so good. So you get some Peaches and Herb. That's logic. 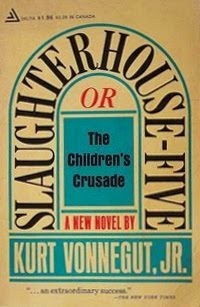 I've been wanting to compare an issue of this “Amber of the Moment” arc to the Kurt Vonnegut tale from which it gets it's name, Slaughterhouse-Five, Or The Children's Crusade: A Duty-dance with Death, but aside from the visit to The Now, none of it really felt that strong a link. I was hoping that Makaria, the guard of The Now, would bear more relevance to her namesake from Greek religion (the daughter of Heracles, not the daughter of Hades of the same name), but although she did sacrifice herself to the wave of nothing, she didn't really have a choice in the matter or save anyone in the process. So I circled back around to Vonnegut. Not to the discussion between Billy and the Tralfamadorian of bugs trapped in amber, but to the discussion a few pages later where a Tralfamadorian explains a Tralfamadorian novel to Billy. As this tale by J.M. DeMatteis is best enjoyed in the Tralfamadorian way. Damn, it's fun to type Tralfamadorian. This tale, now in it's fourth chapter, has scattered our team across three time periods -- epochs, really, in that none of them are within the scope of our currently perceived history and future timeline. This chapter is a bit of a transient issue, in that we reunite our team, but it's not the conclusion. Our team is back together, but there's more to come. Our status quo is reestablished, but not quite. Our team dynamic has shifted a bit, but is still the same basic structure. Doom looms all around them, but we know we'll get out of it. 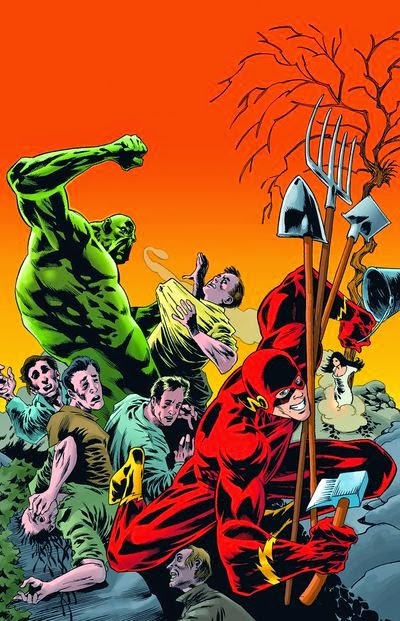 What DeMatteis accomplished by scattering and reuniting out team is not just a fun magical romp through time, but an introspection in to each of the members of the Justice League Dark. For each character, he exposed to us both a justification for their inclusion on the team (and in the series) and the flaws or doubts they must personally overcome.